Mount Vernon is one of Baltimore’s oldest neighborhoods, and home to the city’s most wealthy and fashionable families. The neighborhood is located just north of downtown Baltimore, and was named after the Mount Vernon home of George Washington. 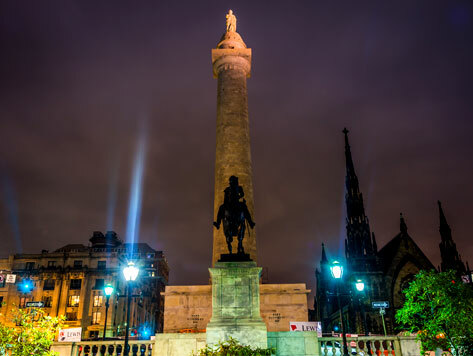 The neighborhood’s main focal point is the original Washington Monument, a massive pillar commenced in 1815 to commemorate the first president of the United States. With its close proximity to downtown and the Inner Harbor, Mount Vernon is home to many popular Baltimore attractions, including the Peabody Library, Johns Hopkins University, Walters Art Museum, Maryland Historical Society Museum and Library, Patricia & Arthur Modell Performing Arts Center at the Lyric, and Enoch Pratt Free Library Central Branch.